Request maintenance online or by calling 212-677-5744 (24 hours a day). 568 Grand St. with entrance on Lewis St. The Maintenance Department is available for service 7 days a week from 8 AM until midnight, with Emergency Service through the overnight from midnight until 8 AM. 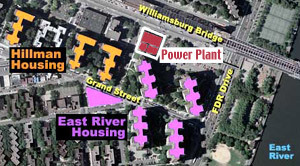 The apartment buildings, shopping center and parking garage are heated from a central boiler plant. It is located in a separate building, which covers an area equal to a city block. We have recently upgraded our heating system with a new boiler. View the installation video to the left and below. In New York City, nothing is easy, but imagine constructing and moving a boiler large enough to equip and serve an aircraft carrier from Kansas to a steam plant in Lower Manhattan. This video details the final two-day stage of the installation from city street to interior boiler plant. It is a masterstroke of American engineering and competency. The boiler is a fire tube type, has a large capacity and is highly efficient. Use of this boiler has a positive impact on the environment equating to the removal of 4,700 cars from the road every year. The heating system is a two pipe up-feed system with vacuum return. Steam is generated from a central high-pressure boiler plant in which the pressure is 85 pounds per square inch. Steam travels through underground piping mains to the various buildings. At each building, the steam pressure is reduced in a single stage to the five pounds necessary to supply heat to the radiators in the buildings. The new fire tube boiler can burn either gas or oil to produce a maximum of 60,000 pounds per hour of steam and is capable of heating the entire set of buildings. 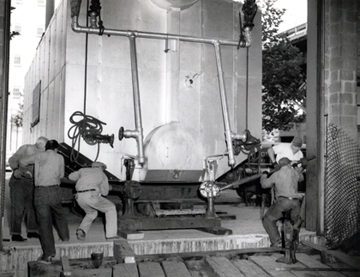 There are two additional existing boilers, both water tube type, which have been modified to burn either gas or oil. Each additional boiler can produce a maximum of 50,000 pounds per hour of steam. Four new oil tanks with a total capacity of 80,000 gallons were added inside the boiler plant to supersede the existing outdoor tanks.